On the advice of, well, it seems like pretty much the entire Internet, I decided to give Doki Doki Literature Club a try. First, that it presented itself as a sort of pink-fluffy-cotton-candy romance VN, the normal sort of “hapless Joe winds up surrounded by cute girls and falls in love” story. Second, that this was entirely untrue, and that it was going to be all kinds of messed up. It turns out that both are true, and also that you really shouldn’t know any more than that when you play through it. I realize that this is not a terribly convincing argument for trying it out, but if you don’t trust me, please trust everyone else on the Internet who are singing this game’s praises. You can get it from Steam, or from the developer’s own site, and it will cost you exactly zero dollars from either place. This entry was posted in mac, videogames, visual novels. Bookmark the permalink. I am interested in this. If there’s some sort of messed up game in there then I want to check it out. I recommend it, for sure! It does take about three hours before the crazy really kicks in, so give it some lead up time. I checked on HLTB which says it takes about 4 hours to beat. I’m excited to give it a go. You are correct. 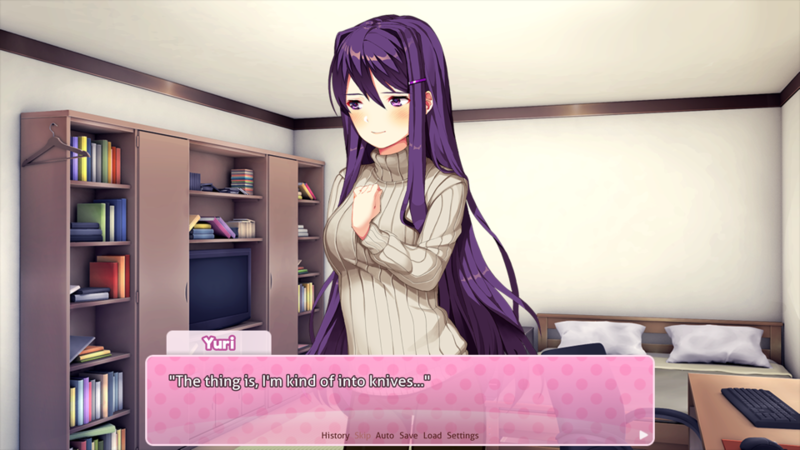 Yuri is best girl. Even with… well, you know.